Staff photo by Doug Strickland / Plant director Corey Jahn, left, speaks with Gov. 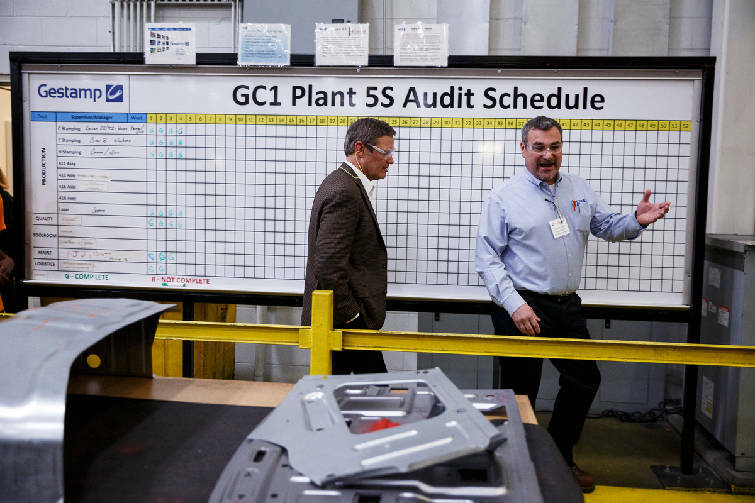 Bill Lee as he tours Gestamp Inc. on Friday, Feb. 1, 2019, in Chattanooga, Tenn. This was Gov. Lee's first visit to Chattanoga as Governor of Tennessee. This story was updated Feb. 5, 2019, at 7:25 p.m. with more information. Staff photo by Doug Strickland / Gov. Bill Lee shakes hands with Hamilton County Schools Superintendent Bryan Johnson, center, during a visit to Gestamp Inc. on Friday, Feb. 1, 2019, in Chattanooga, Tenn. This was Gov. Lee's first visit to Chattanoga as Governor of Tennessee. "We believe GIVE is a key step for the future of our kids and ensuring we can fill the jobs of tomorrow," Lee said in a statement. The GIVE initiative is described by the governor's office as a "two-pronged approach" that uses regional partnerships to develop work-based learning and apprenticeship opportunities. It would support regional partnerships among schools, industry and technical colleges. Lee also wants to double the number of state-paid, dual-credit vocational or technical classes that high schoolers can take at community and technical colleges from two to four classes. The governor said in a news release he thinks the proposal will prove "transformational for Tennesseans and the future of our state. We have the opportunity to help students discover quality career paths and gain skills that are needed right now in the workforce by emphasizing career and technical education." How much money is needed remains unclear. Lee later told reporters that won't be revealed until he presents his proposed 2019-2020 budget to the General Assembly. "We know the numbers, but the process is that we have to present that budget to the Legislature," Lee told reporters, later noting, "we have to let the legislature see it. There are [lottery] proceeds that will be sufficient to fund the additional" funding for the dual credit programs. Staff photo by Doug Strickland / Plant director Corey Jahn, right, speaks with Gov. 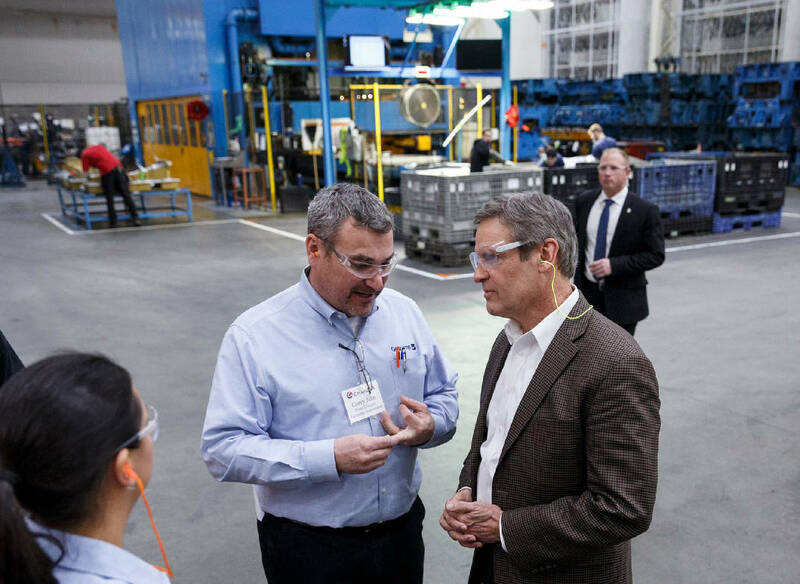 Bill Lee as he tours Gestamp Inc. on Friday, Feb. 1, 2019, in Chattanooga, Tenn. This was Gov. Lee's first visit to Chattanoga as Governor of Tennessee. The annual spending plan will be released publicly when he makes his first State of the State address to lawmakers on March 4. According to the governor's office, the program would enable communities to have funding and flexibility to build programs that best reflect local needs. They would work directly with private industry to structure programming. "With GIVE, there is now a framework in place to partner with the private sector in addressing gaps in our workforce," Lee stated. "This initiative also puts students in charge of their future by preparing them for a good job right out of high school." Using the existing framework of the state's Labor Education Alignment Program (LEAP), the governor says he will recommend new funding to support work-based learning through GIVE Community Grants. "It is time to make sure education in Tennessee embraces multiple pathways to success," Lee said. "We believe GIVE is a key step for the future of our kids and ensuring we can fill the jobs of tomorrow." The competitive grants will go to regional partnerships among Tennessee Colleges of Applied Technology (TCATs), industry and schools. Emphasis will be on work-based learning and apprenticeships, as well as "market-driven" dual-credit opportunities and expansion of "industry-informed" career and technical educational offerings at local high schools. During a Chattanooga trip last week, Lee toured automotive supplier Gestamp and met with high school students who are part of the company's work-based learning program. The governor also participated in a roundtable on vocational education hosted by the Chattanooga Chamber of Commerce. "This is a perfect example today not only of a great job-producing, Tennessee-based company, but one that partners in the ways that need to be done to prepare the workforce of the future," Lee later said. In partnership with Hamilton County Schools, Gestamp houses Tennessee's first work-based learning program to earn a U.S. Department of Labor registered apprenticeship designation. The governor also toured Kingsport, Tennessee, where he touted an apprenticeship program at the Regional Center for Advanced Manufacturing. Accompanying Lee was his new education commissioner, Jeff McCord, a former vice president for Economic and Workforce Development at Northeast State Community College. At Northeast State, McCord was in charge of Workforce Solutions, which includes a focus on registered apprenticeship programs and a technical career education academy at the Regional Center for Advanced Manufacturing.